“My brain was slower than my mouth.” Everyone has moments like this. We say something unfiltered. We speak without thinking. We communicate things without a clear intention. We all fall guilty of this from time to time—after all, we are only human. However, Maine’s Governor Paul LePage’s recent ‘slip up’ was not his first and it came at exactly the wrong time. On January 6, 2016, Gov. LePage spoke at a town hall meeting in Bridgeton, Maine, hoping to persuade the people of his state to support his legislative agenda. About 30 minutes into the meeting, Gov. LePage was asked to address the state’s growing substance abuse problem. During his response, Governor LePage spoke about how heroin is coming into Maine through out-of-state drug dealers. Oops. Not only did Gov. LePage not support this outlandish statement with any facts, but it was quickly interpreted as playing into long-standing racial stereotypes: black drug dealers knocking up young white girls. Within hours, Gov. LePage’s latest inflammatory comments spread like wildfire across social media, and were quickly picked up by major national media including The New York Times, The Washington Post, The Boston Globe, and Huffington Post. And Gov. LePage’s comment quickly reached the national political stage as part of the 2016 presidential election. However, this was not enough to stop the firestorm of criticism coming the governor’s way inside and outside of his state. On Friday, January 8, Gov. LePage held a press conference to address the comments he had made two days earlier. Beyond the national criticism and media attention around Gov. LePage’s statement, the governor faced serious problems in his own state. At the same time as Gov. LePage was being scorned nationally for his racist comment, a group of nine Maine legislators were getting ready to push for Gov. LePage’s impeachment. This would be the first time ever in Maine’s history that a sitting governor would be subject to impeachment proceedings. The impeachment motion was not about any of the governor’s inflammatory comments, but rather accusing him of abuse of power, citing eight incidents of alleged misconduct including a secret investigation into the Maine Human Rights Commission and a threat made that cost Gov. LePage’s political opponent, the Democratic House Speaker Mark Eves, a private-sector job. Although the impeachment order failed, there is a lesson here. Gov. LePage, in a moment when he was already under scrutiny in his state by his constituents and Maine’s House of Representatives, made an unplanned, offensive, inflammatory comment that earned him national criticism. His comments and the statewide impeachment effort became a national story. Gov. LePage lost support in those final critical moments before the impeachment vote. And he gave his opponents more ammunition to use as they continue to admonish him and his actions as governor. Though for now Gov. LePage remains in his role, what will this mean for his legislative agenda? How will this affect his already low approval rating? Whether a politician, a CEO, an activist, or anyone else in the public eye—when our brains move slower than our mouths, it can come at a serious cost and make it much harder to achieve our goals. When we develop the discipline to communicate with intention, to have our brains move faster than our mouths, and to communicate in ways that provoke a reaction that will help us achieve our goals, we not only achieve our goals faster, but also minimize the chance of self-inflicted harm. Seelye, Katharine Q. “Gov. Paul LePage of Main Says Racial Comment Was a ‘Slip-Up'” New York Times. New York Times, 8 Jan. 2016. Web. <http://www.nytimes.com/politics/first-draft/2016/01/08/gov-paul-lepage-of-maine-denies-making-racist-remarks/?contentCollection=Politics&_r=0>. Billings, Randy. 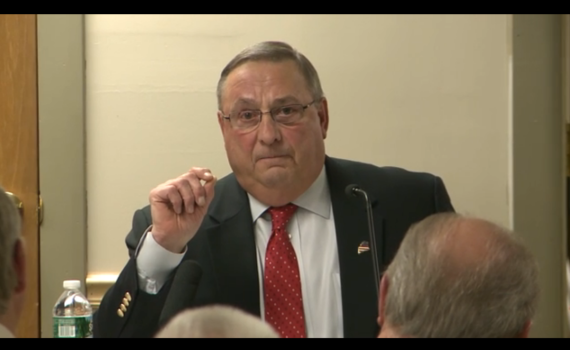 “LePage in Spotlight for Saying Drug Dealers Impregnate ‘white Girls'” Portland Press Herald. MaineToday Media, 7 Jan. 2016. Web. <http://www.pressherald.com/2016/01/07/lepage-accused-of-making-racist-comment-at-bridgton-meeting/>. “January 11, 2016 — Colin Quinn.” The Daily Show with Trevor Noah. Comedy Central. New York, New York, 11 Jan. 2016. Television. Merrill, Paul. “Impeachment Process Could Begin Thursday for Gov. Paul LePage.” WMTV-8 ABC. Hearst Television, Inc., 11 Jan. 2016. Web. <http://www.wmtw.com/politics/impeachment-process-could-begin-thursday-for-gov-paul-lepage/37382486>. Graham, David A. “The Plot Against Paul LePage.” The Atlantic. The Atlantic Monthly Group, 14 Jan. 2016. Web. <http://www.theatlantic.com/politics/archive/2016/01/the-plot-against-paul-lepage/424014/>. The Associated Press. “Maine Governor Calls Failed Impeachment Effort ‘foolishness'” The New York Times. The New York Times, 14 Jan. 2016. Web. <http://www.nytimes.com/aponline/2016/01/14/us/ap-us-maine-governor-impeachment.html>.